Olive Garden is one of the most recognizable Italian restaurants in the United States. Most meals come with the signature salad and bread sticks, which have become so popular that the restaurant offers a special lunch option of soup, salad and bread sticks. 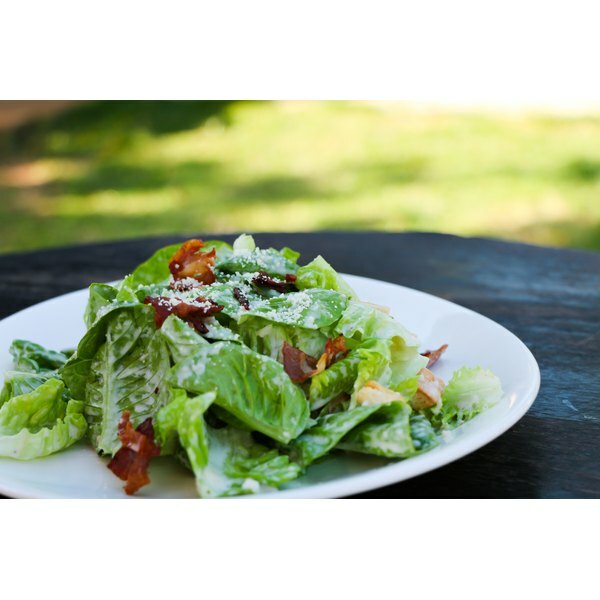 If you are watching your weight or are on a restricted diet, you may be concerned about the house salad dressing. Your server will bring the salad with the dressing on the side upon request. Adding dressing to a serving of Olive Garden salad adds 230 calories. A serving of salad without dressing has 120 calories. A serving with dressing has 350. Olive Garden salad dressing is a vinaigrette style, which is mostly fat. The good news is that most of the 22.5 grams of fat in the dressing is an oil, not a solid fat. Solid fats are high in saturated fats and trans fats, which can raise your cholesterol and contribute to heart disease. Oils are high in monounsaturated fats, which do not raise your cholesterol. Most Americans should limit their sodium intake, and 2,300 mg of sodium, about one teaspoon of salt, is the limit for most adults, according to the 2005 Dietary Guidelines For Americans published by the U.S. Department of Health and Human Services and the U.S. Department of Agriculture. One serving of Olive Garden salad dressings contain 1,380 mg of sodium — nearly half of the recommended daily allowance for healthy adults. Carbohydrates are the basic material that your body uses for energy. The body breaks down foods such as grains, vegetables and sugars into glucose, or blood sugar. This blood sugar fuels cells, tissues and organs. Some carbohydrates, such as sugars, are simple. Your body breaks them down very quickly. Others, such as whole grains and vegetables, are complex. Your body takes longer to break them down, so they give you a more sustained energy source. One serving of Olive Garden salad with dressing contains 22 grams of carbohydrates. A serving of salad without dressing contains 17 grams of carbohydrates. Most of the carbohydrates in a serving of salad come from the lettuce and vegetables. If you are sensitive to gluten, the protein in wheat, eating out can be challenging. Olive Garden salad dressings are gluten free. Be sure to order your salad without croutons. Ordering your salad without croutons also lowers the overall calorie and sodium count of the dish.